Not elephants. Although, as this drought continues, it’s beginning to look a lot like the sere plains of Africa out here. Whaddya mean you can’t see the mountains … through the smoke? Use your imagination. 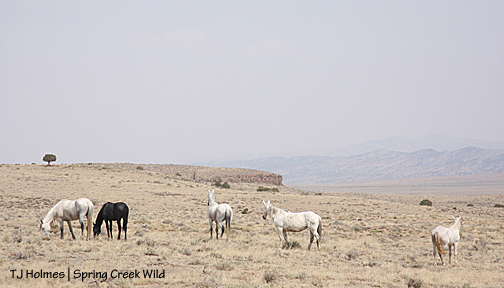 🙂 Although Grey/Traveler’s band seems to also be looking for the mountains, they were watching Chrome’s band walking toward them on their way to the water catchment. Smoke from this fire – way, way, way east of here – apparently has drifted into New Mexico then blown back north and west into Colorado. But it’s not the only fire burning in the region. Maia, clearly at her leisure, worried me; I thought the worst, that the storage tank had drained and the trough was empty, and she was waiting for someone to come fill it, darnit! 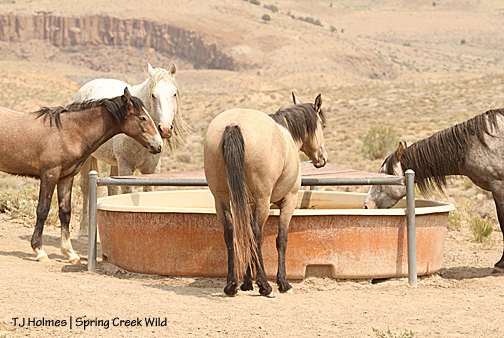 Because of the drought, BLM has been checking to ensure that the horses have enough water sources, and we – National Mustang Association/Colorado – recently got the green light to deliver a load of water – 4,000 gallons – to the catchment tank. Donors and silent-auction-item buyers at the Pati Temple Memorial Benefit Bash, this is the first use of the money you helped us raise! 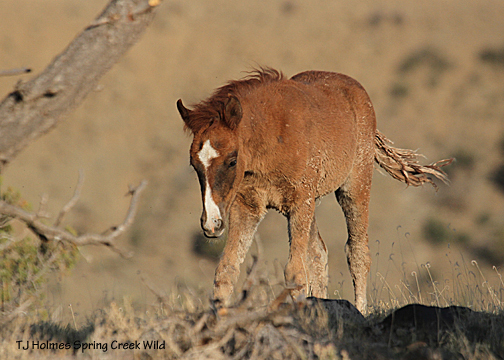 Interestingly, the area of the catchment is used primarily by Chrome’s band and rarely by other bands. But some other bands have started to find the water – and the good forage in this area. 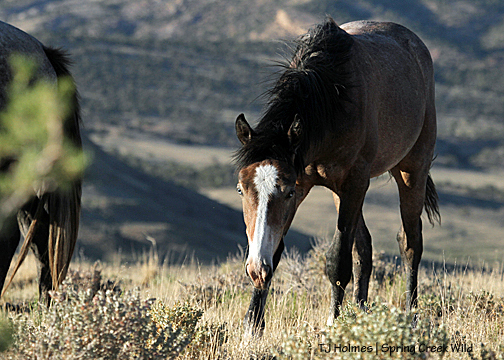 Water is a good way to disperse the horses’ grazing and get them to use under-used areas. Chrome’s band at the catchment trough, drinking clean water. 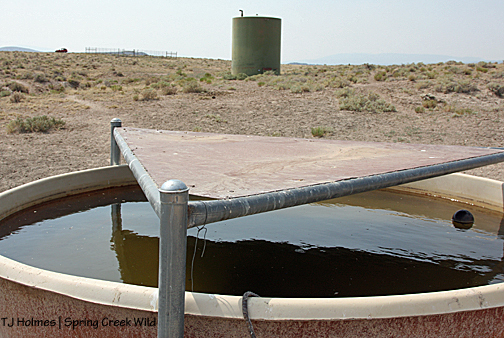 This is an important water source because it’s the only clean source of water in the basin. 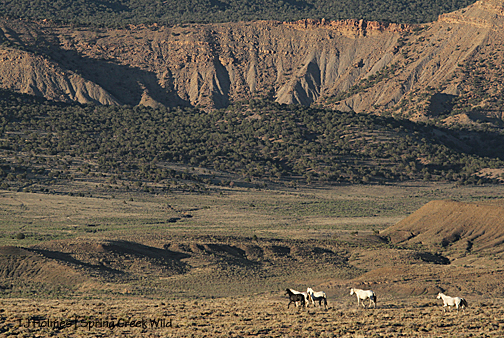 The others are high in alkalinity and salt because of the basin’s soils. The dusky, hazy color cast is because of the smoke. The temperature hit 110 degrees Friday. On Thursday, the high was 108. Smoke, wind, heat, zero moisture = ugh. 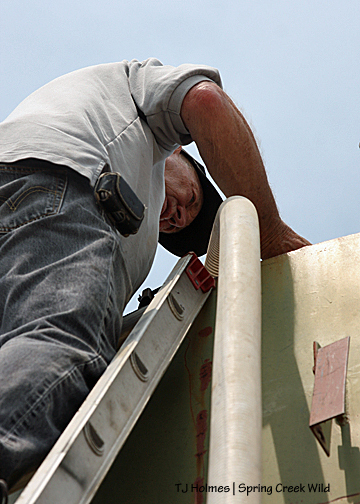 Cecil Foster, owner of Foster’s Water, to the rescue. 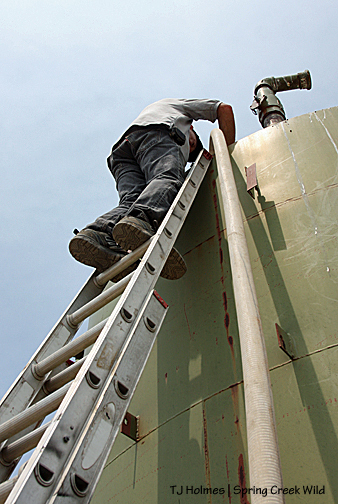 The storage tank is about 15 feet tall, so Cecil brings his ladder to access the hatch at the top. At right is the hose from his water truck. 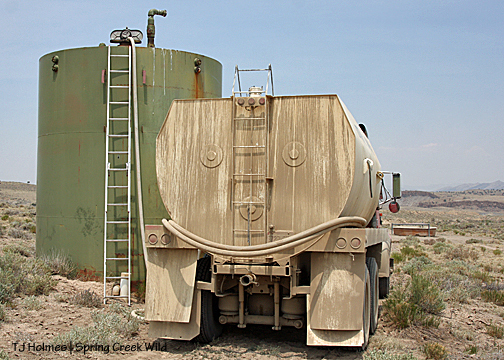 Seen here are his water truck, the hose to the tank and the water trough in the background at right. Thanks, Cecil! He also donated a load of water for the benefit’s silent auction. 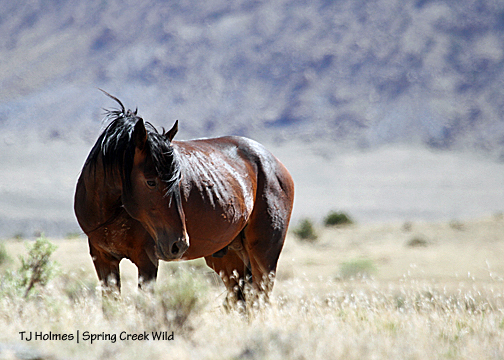 Cecil is a super nice man, and a friend of the mustangs of Spring Creek Basin. Thank you, NMA/CO, for the delivery of water to the mustangs! 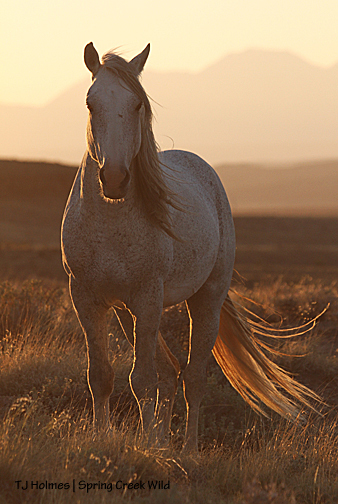 Sunlit Chrome at the end of the day. Master Kwana just gets more and more handsome! He’s in this gorgeous warm-brown grey phase. Any color would go well with those lovely eyes! Kreacher and Seven had a little discussion around the water hole. 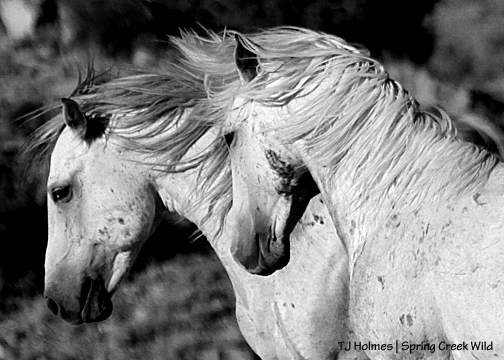 Loved their shades of grey and the strands of their manes that seem to flow into each other with the ever-present wind. Love these boys! It has been a while since Duke made an appearance on the blog, and that’s way too long. The elder mister still is with Kreacher (bachelor buddies), and they were watching Hollywood’s and Comanche’s bands. 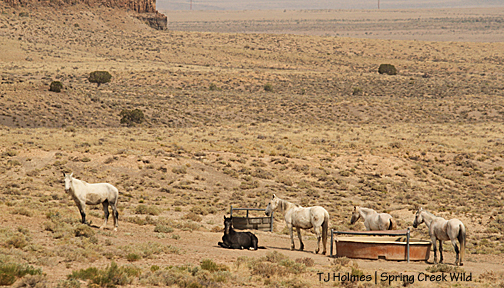 We first saw him in the shade of a juniper, waiting out some of the day’s heat. Then he decided to come closer to see what we were about. I don’t know about him, but we exclaimed several times about how handsome he is! Grey/Traveler’s band at the end of the longest day in Spring Creek Basin.